The New Ulm Lions recently donated $1000 to the New Ulm Public Library. L - R are, Lions Gayle O'Connor, Jason Engstrom, and Carol Behrens presenting the check to the Library Staff, L - R, April Ide, Leasa Sieve, Betty Roiger and Paulina Poplawska. 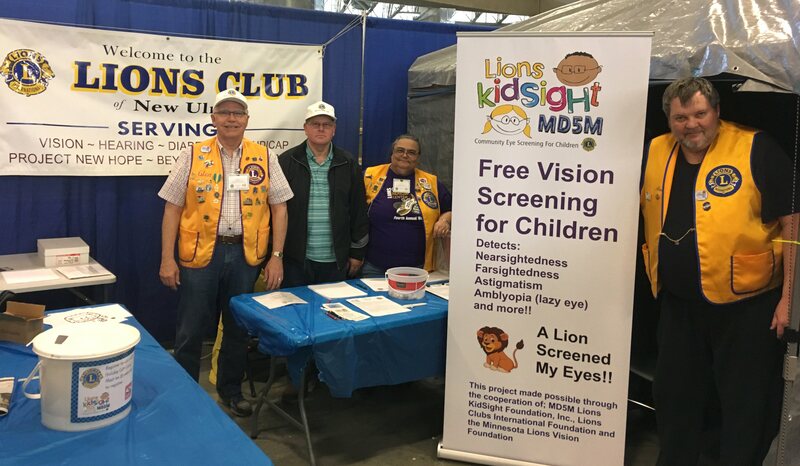 The New Ulm Lions did free eye screenings at the New Ulm Home and Health Show. We screened 173 children and found 10 children that needed to be referred to an eye doctor. L-R, are Lion Glen Setterholm, Lynn Zimanski, Lion Sue Harder and Lion Brad Kirk. Lions Club of New Ulm celebrated it's 90th anniversary, Chartered March 22, 1929. Pictured, L-R, Lions Roger Norman, 41 years; Don Wilfahrt, 51 years, and Terry Dempsey, 53 years. Lion Dave Lynn, 41 years of service, not pictured. 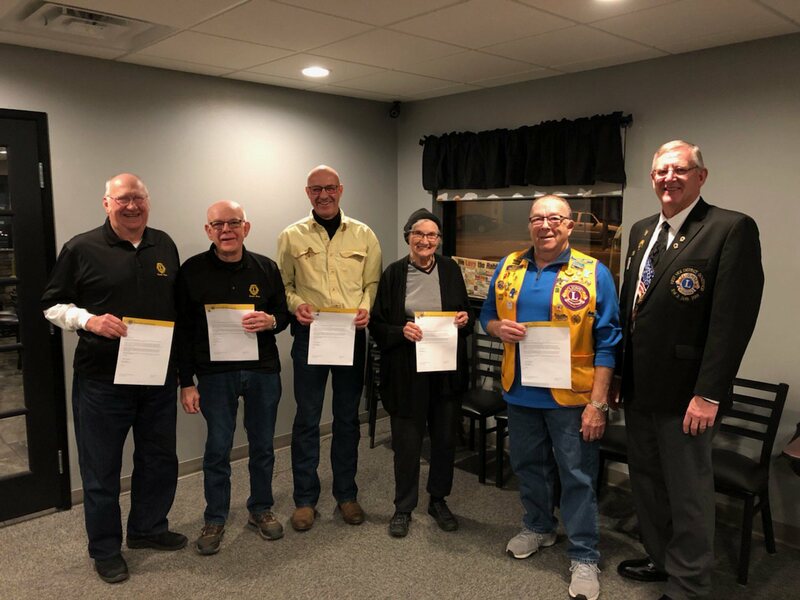 The New Ulm Lions Club presented Helen Keller Sight Awards to Dr. Rebecca Huisken and Lion Brad Kirk at their February 14, 2019 meeting. Pictured, L-R, PDG LeRoy Levorson, Dr. Rebecca Huisken, Lion Brad Kirk and Lion Glen Setterholm. 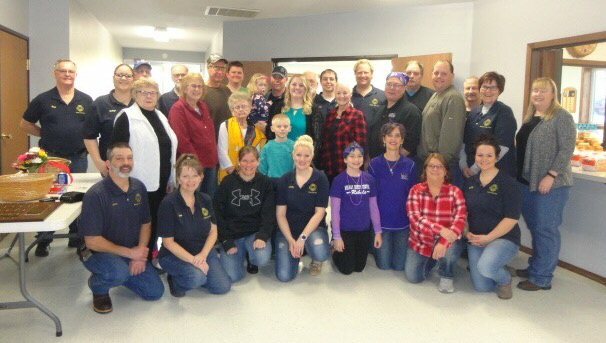 Hadley Lions Club served over 350 customers who enjoyed nine different roasters of Chili and a Raffle in support of a local woman, Karla, who is recovering from a stroke. Over $7,000 was donated to Karla. The winning Hadley Lions chili cook was Murray County Central School staff, Jim, Janese and Royale Sieschlag in the purple shirts. Rick Like, Hadley Lions President, far left. Lucan Lions "Years of Service Award", Jan 10, 2019. Members are (L to R): Del Skoblik, 45 Years; Bob Plaetz, 45 Years; Dennis Plaetz 25 Years; Alice Thull for Ray Thull, 45 years; Ron Plaetz, 45 Years; 1VDG Don Kuehl. The Hadley Lioness Club collected 110 bags of shoes. The Lions Club of New Ulm donated $500 to the New Ulm Area Emergency Food Shelf. Executive Director, and Lion, Brad Kirk is shown excepting the donation from New Ulm Lions President Gayle O'Connor and Lion John Micheel.